I spent a few days on the wonderful Gold Coast, where it was glorious sunshine and a lovely 27ºC. Hard to believe that this is heading into their winter season and many of the locals could be seen sporting cardigans and complaining about being cold! It’s clear from speaking to practice owners and doctors already out on the coast that the population is booming and is set to continue for some time. So it’s no surprise to hear on my return that the north end of the Gold Coast is Australia's fastest growing housing market based on 2015/16 performance*. For those of you who haven’t yet visited this part of Australia, it has a lot to offer the ex-pat looking to live the Australian dream. Firstly, housing is more affordable than in the other major cities and you can definitely find that modern home with a pool within a reasonable budget. Take a look at the properties available in the developing area of Coomera Waters, a marina village with a variety of properties and recreational facilities which offer a fantastic lifestyle for families. Prices range from around AU$600,000 to over AU$1 million (some are even waterfront properties with a private jetty for your own boat! You are never far away from the fantastic beach that runs 70km along the coastline from the tip of the Gold Coast to the border with New South Wales. 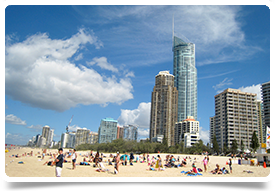 Take up surfing on the famous Surfers Paradise beach, a busy hub which also hosts night markets and sporting events or seek out one of the quieter, family beaches dotted along the coastline. Gold Coast is welcoming the Commonwealth Games in 2018, so if you are sporty you’ll find a host of modern sporting facilities popping up in the area. Prefer a bit of retail therapy? Shopping malls, boutiques and local markets are dotted up and down the coast. You’ll find designer stores such as Louis Vuitton, Gucci and Fendi at Surfers Paradise alongside surfer stores and sports shops. Westfield have started to build what is thought to be their largest mall in the southern hemisphere. Foodies are well catered for too with a great selection of restaurants, fine dining, food from around the world, beach front seafood restaurants, burger joints and popular chains are all available. Upmarket wine and cocktail bars and plenty of pubs to suit everyone. Now, what about the children? 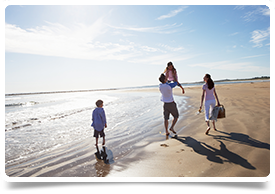 Are you eager to move to Australia so they can enjoy a more outdoor lifestyle? Well they are well and truly catered for in terms of entertainment. Theme parks, water parks, zoos and activities are in abundance. Whether they are adrenaline junkies, wildlife enthusiasts or enjoy sports they will not be bored! There are lots of fun things for babies and younger children too. 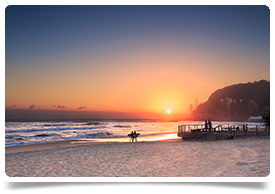 I’m currently working on a number of vacancies for GPs who are looking to relocate to the Gold Coast. It’s clear that GPs are still very much in demand and with a growing population that demand is set to continue. Have a browse through some of our most recent positions and get in touch to discuss your own situation and how we can help you make your dream a reality. You could be out on the Gold Coast for the start of 2018, make this winter your last cold one!